Thank you for stopping by today, I hope you are well. It is very cold here and we have not seen the sun all day. How is the weather with you? A quick post today. Now, before I talk about the card, I really must apologise for the quality of this photograph, the combination of how dark it is today and the very light colour of the backing papers, combined with all of those reflective surfaces, made it very hard to get just right. 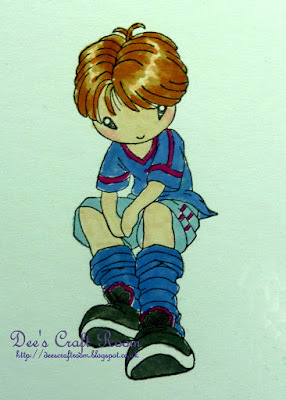 This is a Sugar Nellie rubber stamp called 'Sporty' Home Grown Manga. I coloured him with Promarkers and mounted him on gold mirri card. The backing papers is from a DoveCraft pack and both the sentiment and the button are from my stash. Such a great card. The colors are lovely. I like how simple it looks but the image is so detailed. The boys hair is awesome...excellent coloring! Thank you, I find male cards quite hard. 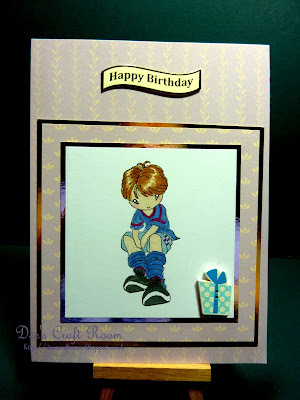 I think that they do not want flowers and frills, so I keep the card simple and make it all about the colouring. I think those cards are hard to make as well. I use too much glitter and flowers. Boys do not want that! You did great on this card! They all seem to be male birthdays at the moment, I need to get another card made and in the post for next week. Thank you so much Pamellia.